An elaborate and illegal camouflaged residence, outfitted with bunk beds and a barbecue patio, has been discovered near a Los Angeles County animal refuge. 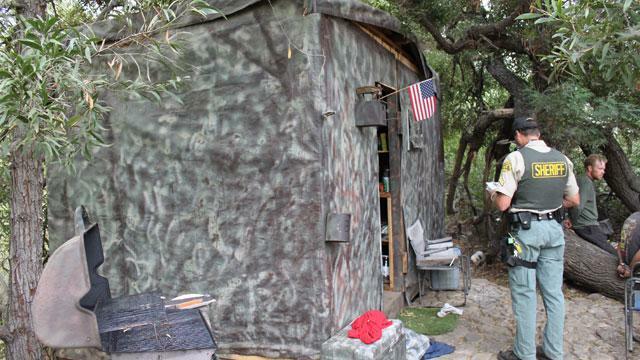 Eight months ago, Robert Downs, 51, set up a small structure in the woods near the Tujunga Ponds Wildlife Sanctuary in Sunland, Calif. To hide his home from police, Downs, who was previously homeless, sprayed it with camouflage paint and cut down nearby trees, said Johnie Jones, a deputy in the Parks Bureau of the Los Angeles County Sheriff's Department. The structure, which Downs built with materials he bought at Home Depot, contained four bunk beds built into the walls, tables, shelves and fire extinguishers. Outside were a rock patio, a barbecue grill and more tables. An American flag was draped over Downs' bed. Downs stood a chance of evading major legal trouble for his hidden house, but sheriff's deputies also discovered that he cultivated eight marijuana plants outside the structure, a felony because he did not have a permit to do so, Jones said. When Los Angeles County Sheriff's Department deputies found Downs's residence while on patrol Monday, he told them he had been living in the 13.5-acre wildlife sanctuary for more than a year, Jones said. "He seems like he had some skills," Jones said. "I've seen homeless sweeps before where people have brought tents or mattresses, but nothing this elaborate." Downs was arrested on charges of marijuana cultivation and building a house on county property, Jones said. He is being held on a $30,000 bond, Jones said. Downs was found with two others who were cited with infractions and then released, Jones said. The Los Angeles County Department of Public Works will remove the structure from the park over the next two weeks.